The Perfectionists creator I. Marlene King and star Sasha Pieterse spoke with The Advocate about the new show's LGBTQ visibility and just why Alison left Emily. 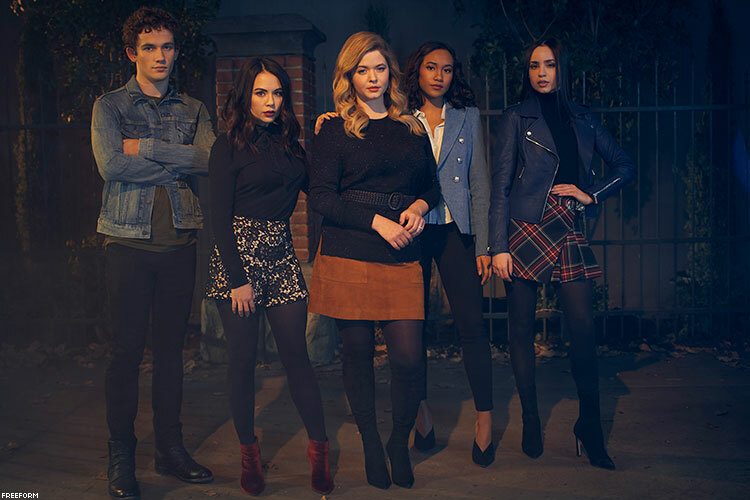 For devotees of Pretty Little Liars, the twisting mystery that had fans guessing who (various forms) of “A” was for seven seasons, Beacon Heights, where the show’s spin-off Pretty Little Liars: The Perfectionists unfolds, is an uncanny West Coast answer to PLL’s Pennsylvania-based fishbowl that was Rosewood. Save for familiar faces like PLL’s original dead mean girl Alison and the tenuously stable tech genius Mona, The Perfectionists introduces a brand-new cast of unreliable, morally ambiguous characters who are caught in a different mystery and a web of lies of their own design. While The Perfectionists, shot near Portland, Ore., arrives with fabulous eerie newness, five minutes into the pilot it’s clear that it’s still the world of intrigue and LGBTQ visibility that PLL creator I. Marlene King built. But it’s also more than that. For all of PLL’s zany plot lines and elements requiring suspension of disbelief, like the time the main characters’ omniscient cyberbully A impregnated the no-longer-dead Alison with her true love Emily’s fertilized embryos (more on that to come), the series was grounded in heartfelt stories of female friendship and also important landmark LGBTQ representation. Premiering on Freeform (then ABC Family) in 2010, the series introduced a thoughtfully navigated coming-out story for Emily (Shay Mitchell), who was gay, and later for Alison, who is bisexual. 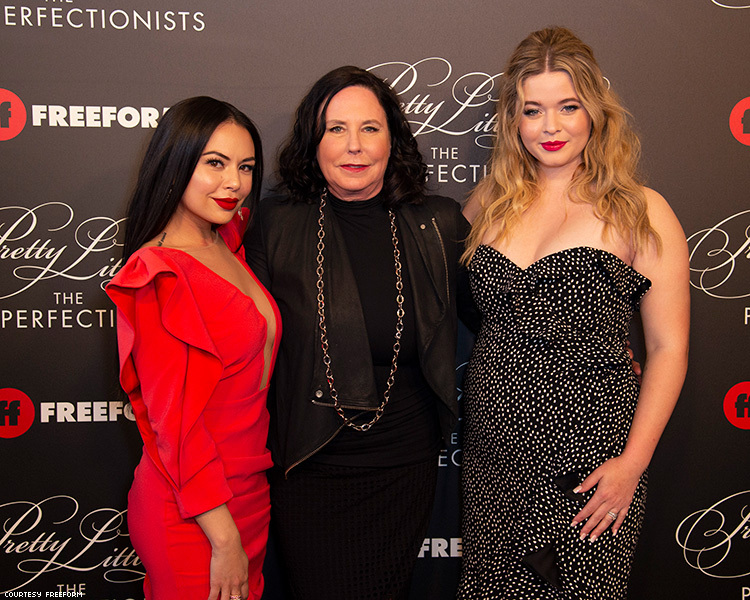 For all of its departure from PLL, amid the secrets and lies that unfold at Beacon Heights University, where Alison has landed as a teacher’s assistant and mentor to the younger characters, The Perfectionists hews closely to its parent show with its focus on surveillance (being watched by an all-knowing entity). But mainly, the new series follows in PLL's footsteps in its telling of stories with a heart and its commitment to moving the needle forward with LGBTQ visibility in TV — especially with Sasha Pieterse’s Alison leading the show and with the introduction of gay and bisexual male characters. “We’re very excited to have a gay male character and a bisexual character, and you may see a budding lesbian romance down the line. We’re really happy to be inclusive on the show,” King says. While King remains humble about her place in creating game-changing television, especially for young LGBTQ people within the PLL universe, Pieterse credits King, who is a lesbian, with pushing for diversity on the parent show and on The Perfectionists. Ten years ago PLL put actresses including relative unknowns Mitchell, Troian Bellisario, and Ashley Benson on the map (Lucy Hale was the biggest star of the series at the time) along with Pieterse and Janel Parrish, who plays the deliciously troubled Mona and who is Pieterse’s co-lead on the new series. Soon after arriving in Beacon Heights, Alison discovers that her nemesis and sparring partner in many a slap-fight, Mona, manipulated her into coming to the West Coast town — ostensibly to get to the bottom of the recent death of the daughter of Beacon Heights’s premier family, the Hotchkisses. The daughter, in true PLL style, happens to be a doppelganger for Alison. 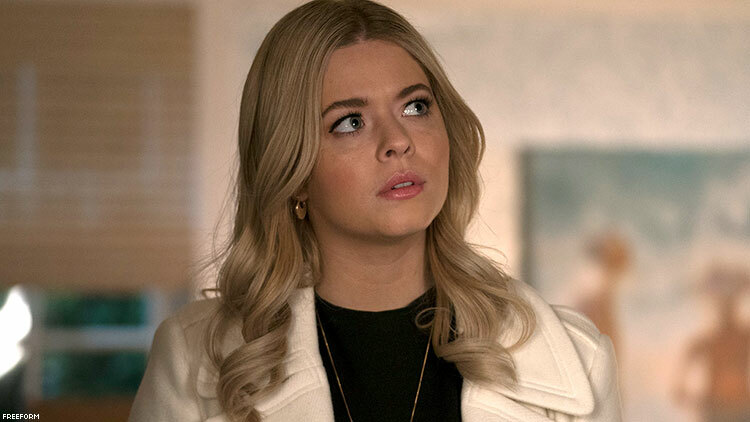 Pieterse, who was in her early teens when she shot the PLL pilot about a decade ago, promises that The Perfectionists, which picks up with Alison after she's left her wife, Emily, and their twins behind in Rosewood to truly find herself, carries King’s vision of bringing sincere stories about human interaction forward. And that's even as the pilot episode, which introduces a new crew of pretty little liars including Sofia Carson’s Ava, Sydney Park’s Caitlin, and Eli Brown’s gay cellist Dylan, closes with a murder. At 23, Pieterse, between playing Alison for seven seasons and starring in the gay-themed teen comedy G.B.F., has amassed her own queer following. And she's especially excited about the introduction of Dylan into PLL’s world. “Dylan is the first gay male character in the Pretty Little Liars series, and the best part about it is that it's not really addressed. I don't mean it's not spoken about. It's just normal because it is,” Pieterse says. "It's not like the network was like, Well, we have to have this demographic in here. Nothing was pushed. It was like this was a fun, great, cool character. This was his relationship, and it's amazing, and it's supportive, and it's loving." Both King and Pieterse assure that The Perfectionists will appeal to new viewers without confusing them with leftover PLL plotlines while also offering enough Easter eggs and nods to fans of the parent series (like a Lady Gaga musical allusion in the pilot’s opening moments). One major part of the narrative that could be a sticking point for fans of Alison and Emily (Emison) as a couple is that The Perfectionists sees Alison —who was once presumed dead, later found to have been buried alive, and who was in hiding for about five seasons of PLL before reuniting with her friends and confessing her love for Emily — pick up and leave her wife and children. But Pieterse cautions viewers of PLL to remember that Alison never asked for the babies, considering it was Uber-A who violated and impregnated her with Emily’s fertilized embryos. “One of my main questions when I started this was, What is the deal with Emily and the babies? Alison seems like such a bad mom,” Pieterse says of Alison taking on a position a world away from her family. “I had to kind of fill in my storyline in there to motivate my feelings and the way that Alison is reacting. What resonated was the fact that they [Alison and Emily] have been A-less for quite a while and it's more about the dust settling. As much as she loves her babies, she didn't ask for them,” Pieterse says. For King’s part, she knows that Emison fans are passionate. She says she tried to be truthful to the character of Alison while honoring the epic love story. Regarding the real world, if Rosewood was ultimately a fishbowl where everyone was being spied upon a la Alfred Hitchcock’s Rear Window, then The Perfectionists takes the idea of surveillance to new heights during a time when it seems like no one is free from scrutiny on social media or elsewhere. “It only gets darker and creepier and that's really exciting,” Pieterse says. The Perfectionists airs Wednesdays on Freeform, beginning tonight.